At the conclusion of the discussion, guests were given the opportunity to ask questions to the panellists and this is the part of the evening that you can listen to here. This is an issue of worldwide importance. Intensive production of meat and milk is a major source of greenhouse gases, water pollution and soil degradation. Many people are turning to a vegetarian or vegan diet. However, food production is vital to New Zealand’s economy and to ensuring the world has enough to eat. How will changes in demand, modern technology and an awareness of ethical, environmental and health issues affect our agricultural production? 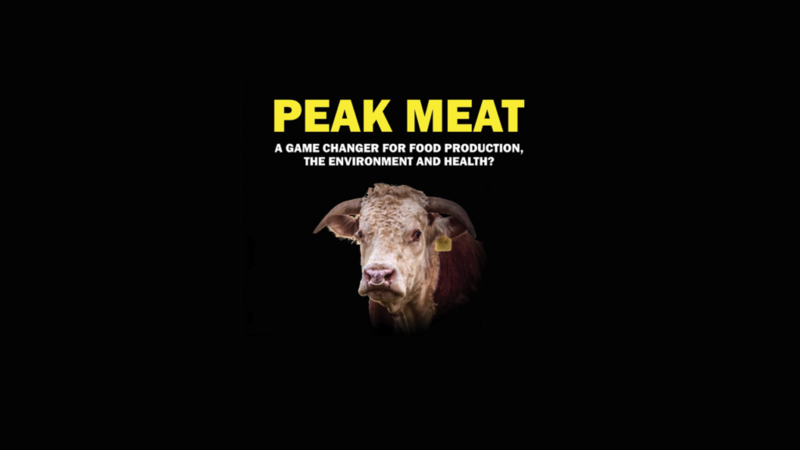 What are the impacts of meat and milk production? People are eating less meat and dairy – why and what are the consequences on our environment, health, farmers, animal welfare and economy? Is artificial meat going to take off? Should we be planning for this? A big thank you to our wonderful sponsors! We extend our sincere appreciation to all our sponsors, Rata Foundation, Selwyn District Council, COGS, Lottery Community and Lincoln University. We hosted a very successful meeting of businesses who have shown an interest in a Selwyn Responsible Business Network in Rolleston on the last day of October. People from local businesses were invited to a social occasion and treated to two high calibre presentations which examined concepts of sustainable practices relating to Power Use and Waste Management. Many of the ideas discussed looked at the cost cutting possibilities that result from adopting more sustainable practices, while others emphasised general environmental concerns. Richard Briggs the Programme Partnership Manager of the Energy Efficiency and Conservation Authority (EECA) surprised the audience with the statistic that businesses typically waste up to 20% of the energy they use; most solutions to this problem are low or no cost solutions which look to making current processes more efficient before looking at any replacement of infrastructure. He strongly suggested that businesses should start looking at the possibilities of making savings by undertaking an energy audit to really assess how much power is being used and where. Details of funding bodies that could help with long term solutions were also shared. The second presentation by Andrew Boyd the Waste and Recycling Manager at Selwyn District Council gave some real insight into the recycling situation around the world and its impact on Selwyn. He explained how the old model of using resources to produce the things we need, and then discarding them as waste, cannot be sustained. The concept of the Circular Economy whereby resources are used in production and then reused was examined with numerous examples cited. Andrew also advised on good recycling habits and gave an insight into the difficulties of the processes. The evening was an enjoyable occasion and people took plenty of useful information away with them. We would like to thank the Selwyn District Council for supporting this initiative. 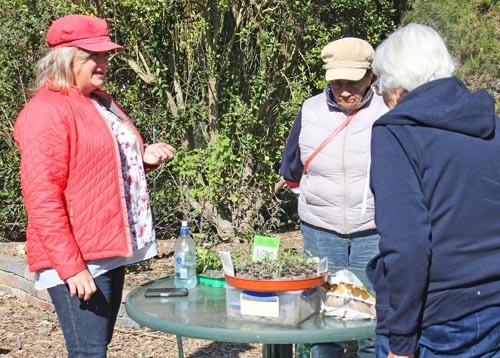 Rachel is a strong advocate for “jiffy pots” which enable vegetables (not root vegetables) to be grown from seed, and avoiding the shock to the seedlings when they are transplanted. Plant the jiffy pot containing the seedling well below the ground surface to prevent it drying out. Her advice on parsnips: New seed is needed every year; plant while there is still a likelihood of frosts (because the cold ground helps to crack the hard seed coat. Otherwise pouring boiling water on the seeds will promote cracking of the seed coat. Rachel’s recommendation for a main summer potato variety is “Summer Beauty”. Its potatoes are medium size, good for boiling and store well. Some plants thrive better when planted in plots rather than rows, particularly sweet corn and broad beans, because pollination via the wind is more effective. 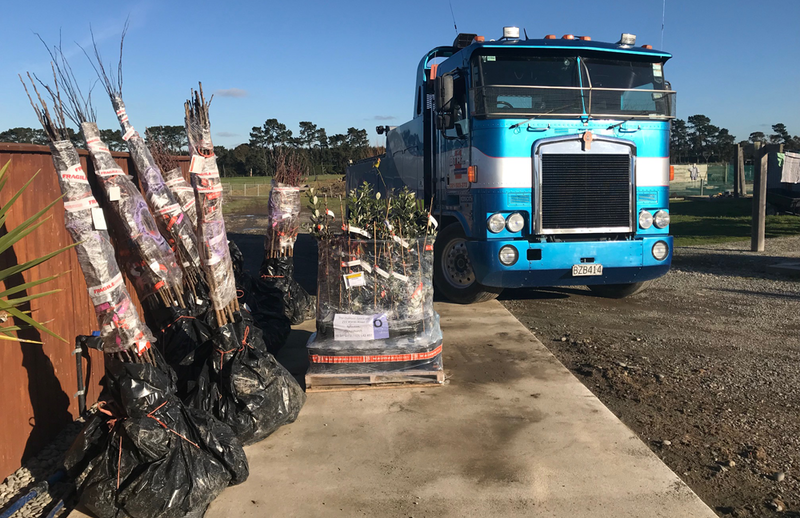 Early in the fruit tree planting season Aaron Bartlett and his team from the Outdoor Space set off again to deliver and plant fruit trees provided free to Primary Schools courtesy of the Lincoln Envirotown Trust with the support of a number of Rolleston businesses. This project is in its fourth year which means that many schools now have 40 additional trees in their grounds. 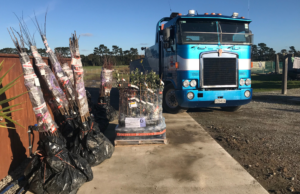 The team delivered 211 trees this year which is a small increase on previous years. It is pleasing to see so many schools benefiting from the generosity of this group of businesses. As seems to be the case each year – the process was not without its drama as it started with the delivery truck becoming stuck at Outdoor Space’s premises and requiring the services of a substantially sized tow truck to extricate it. Next year is the last year of the scheme and hopefully schools will soon start enjoying the fruit. Nineteen films were submitted for this year’s Environmental Film Competition run by Lincoln Envirotown Trust. This marked a substantial increase over previous years and it is to be hoped that it is indicative of people’s concerns about our environment, a willingness to articulate these, and to suggest actions. A particularly pleasing feature of entries this year was that there were no less than 5 independent entries by adult producers alongside the assorted school age group and individual entries. 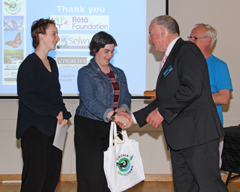 As the Acting Mayor of Selwyn Councillor John Morten pointed out at the Awards Evening, the number of varied entries greatly enhanced the contest but left the judges with a very difficult task indeed.